This is a classic example of an okazuya. Okazuyas bring another dimension to the phrase "have it your way". My "own" mixed plate (US$7.86; price varies depending on items selected). 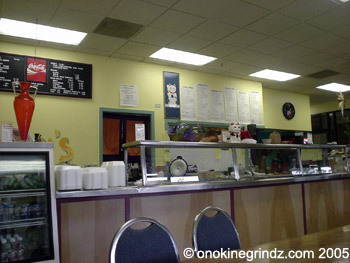 Located in the space previously occupied by New Century Chinese Restaurant, and the extremely short lived Welcome Inn Café, Zaney's is a somewhat unique player amongst the Asian food establishments that one would normally find in the area. Situated on the ground floor of the Smith-Beretania Apartment building, Zaney's is far enough away from the heart of the business district to make a visit here a planned event. Inside, the restaurant spacious and furnished simply with large number of tables and chairs. 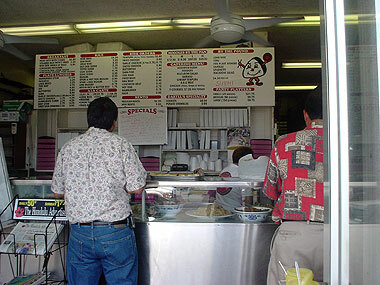 The menu is located right above the entrance to the kitchen, and each day is marked with the dozen or so items that are on offer for that day. 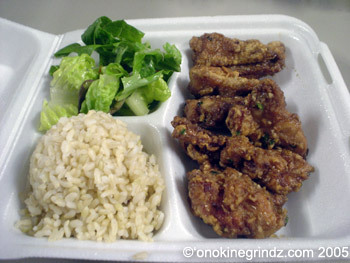 On one of my many visits here, I ordered the mini garlic chicken with brown rice and tossed salad (US$4.00; regular US$5.75). To prepare the garlic chicken, pieces of boneless chicken thighs are battered and deep fried until they are golden brown and crunchy. They are then tossed in a garlic-shoyu sauce which is sweet, salty and just a little spicy. Though they were well coated with sauce, the pieces of chicken still had quite a bit of crunch to them. 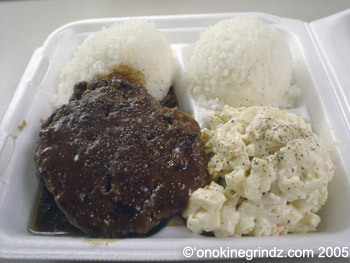 On other ocassions, I've also ordered the hamburger steak (regular US$5.75; mini US$4.00). The regular plate comes with two scoops rice and one scoop macaroni salad. To be quite honest, this really isn't like local style hamburger steak at all. In fact, it reminds me more of the salisbury steak that you'd find in the freezer section of you local grocery store -- you know, like those in the Hungry Man type of TV dinners. On other ocassions, I've had the beef stew and the beef curry, both of which had lots of beef, tender carrots and potatoes, and thick gravy. The only thing that made those dishes less than stellar was the amount of flour/cornstarch used as a thickening agent. The garlic chicken is the stand out here at Zaney's. In my opinion, it's probably some of the best garlic chicken around. The other dishes here are a bit hit and miss, but aren't really too bad -- especially if you take the portion size and price into consideration. Give it a try, you're bound to find something there to like. I've been having quite a number of okazu-style lunches recently. The first was from Mitsu-Ken a couple of weeks back, then it was Gulick just a couple of days ago. Well, I was still craving for okazu food today when I decided that I would try my luck at Mitsuba. 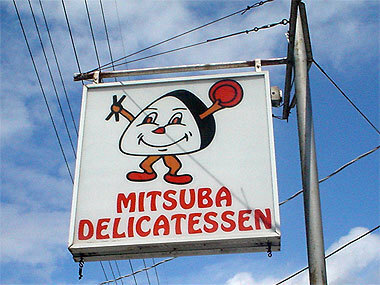 Mitsuba Delicatessen is actually located right across the street from Mitsu-Ken. It's advantage is not the food, but the parking. Unfortunately for me, there was no parking in the lot when I arrived. As I waited for a stall, I was hoping that I would be able to get some of my favorites here today. By the time I finally parked my car and made it inside, there were two people being attended to. That gave me a chance to look at what little was left for me to choose from. I was seriously hoping for some of the sweet potato crumbles or maki sushi, but I knew that I was had arrived much too late. Since I wasn't really hungry, and because there was none of the maki sushi, I settled for one inari sushi (US$.95) and one piece of the garlic chicken (US$.75). When I placed my order, the woman taking my order seemed quite surprised. "Just one piece garlic chicken? ", she said. Yes, I nodded. When it was time to eat, I opened my container to find two pieces. I guess she felt that I needed to eat more. 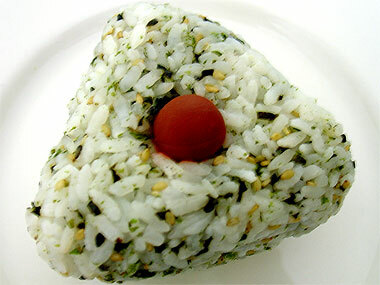 The rice in the HUGE inari sushi was seasoned perfectly, with just the right balance of vinegar-y sweetness. Mixed with the rice, which was stuffed into a "cone" made of aburage (deep fried tofu), was some chopped carrots and chopped string beans. The garlic chicken was deep fried then coated in a sauce which was slightly sweet and just a touch garlic-y. Crisp and crunchy, this was delicious. It was not the same as the garlic chicken at either Sugoi or at Mitsu-Ken, but it was good nonetheless. 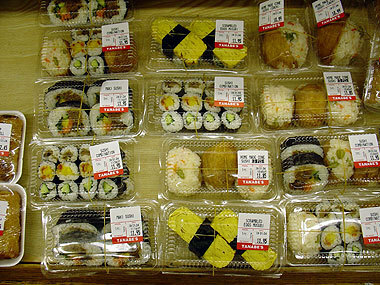 This was probably the least expensive lunch that I have eaten in a long time coming in at only US$1.70! Although it was a small lunch, it was quite enjoyable. 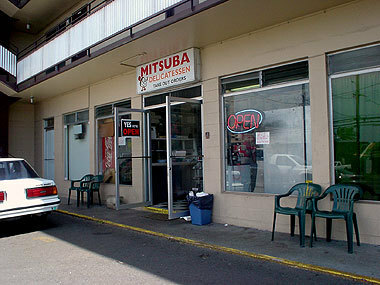 Mitsuba has some of the biggest and tastiest inari sushi in town. Next time, though, I think I'll arrive at the crack of dawn so that I can have some of the maki sushi and the sweet potato crumbles. 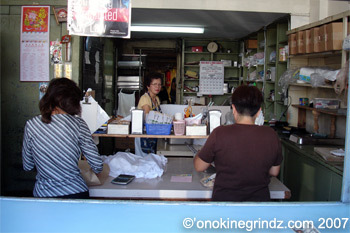 It's not often that I find myself having lunch at a local delicatessen or an okazuya. My main reason for not visiting okazuyas more often are the operating hours. Usually these shops open early and close early, most often times opening at the crack of dawn and closing shortly after lunchtime -- or they close once the food runs out. Today, I was fortunate to be in the vicinity of Gulick Delicatessen. 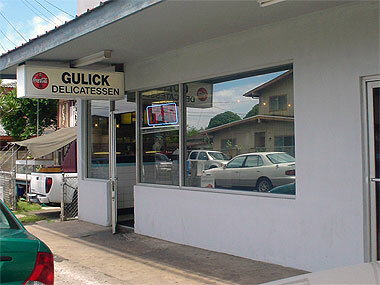 Gulick Delicatessen is a small shop on Gulick Avenue near School Street. 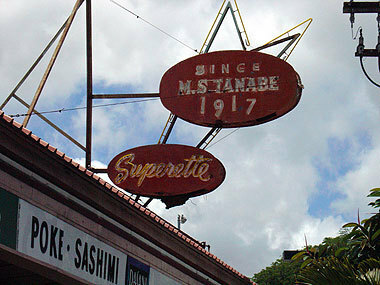 If that sign hanging above the sidewalk was gone, you would probably not guess that the shop was there. The building was rebuilt a while back, and if you had seen the old shop, it would have been much harder to find. It was a small wooden structure, much like the homes that surround it. For those of you that are unfamiliar with the local usage of the word "delicatessen", it's the same as an okazuya. And what is an okazuya? 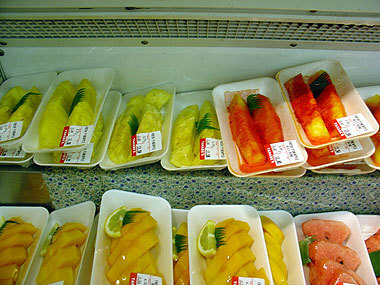 It's a type of shop that serves many different types of side dishes. 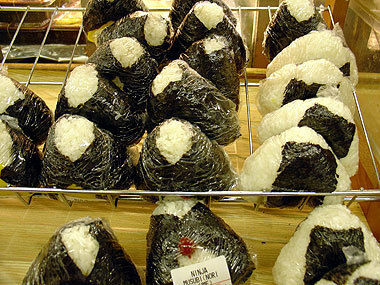 Musubi (rice balls), fried chicken, tempura, chow funn and shoyu hot dogs are just some of the more common dishes these places serve. The items are all reasonably priced, so it's a good option for all of us who like to have a variety of things to choose from. 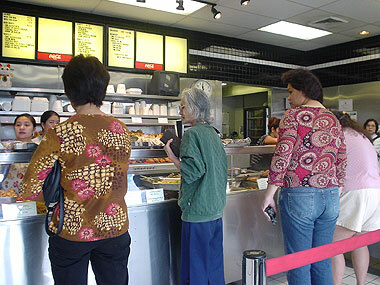 When I got to the shop at about 11:45 am, there were quite a few people there waiting to order their food. However, at Gulick, unlike at many other okazuyas that I've been to, there are many people behind the counter to help you so the wait isn't very long. 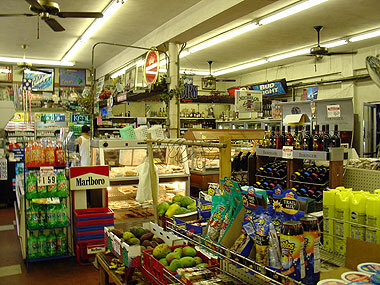 The very first thing you do, is step up to the counter and take a look at all of the food on display. 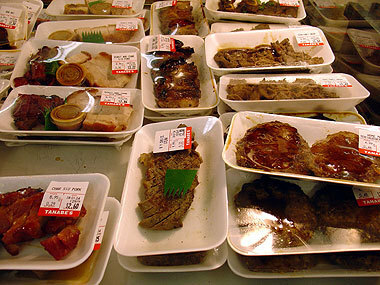 Then, as your stomach starts growling, you make your selections while the counter help piles your selections into a take-out styrofoam container. Finally, it's time to eat! It's fast and it's simple, but the best part is getting to choose your dishes. 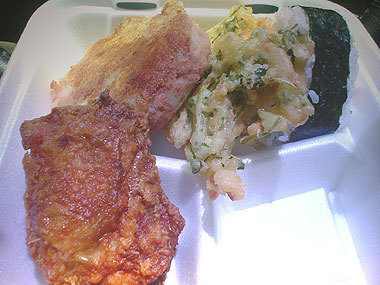 Today, I chose the following (left to right, starting in front) -- fried chicken thigh (US$1.35), corned beef hash patty (US$1.35), vegetable tempura (US$.75), and nori musubi (US$.75). In total, this plate come out to US$4.20. 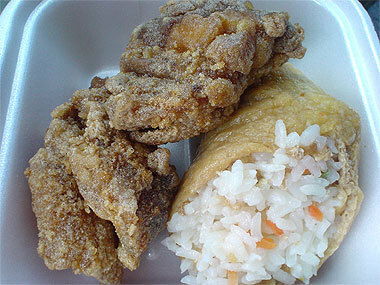 The chicken thigh was fried to a perfect golden brown. Inside, the meat was tender and juicy, just the way I like it. The corned beef hash patty was huge, much larger than any I've had at an okazuya before. The only thing I didn't like about this was that it was a bit sweet. I wonder why? The vegetable tempura was nice and crunchy. The added benefit was that it had just come out from the deep fryer and it was well-drained, which meant that it wasn't oily or greasy. Over the years, I've sample most of the dishes on offer here, and though there have been a few missteps, you can count on most of it to be quite good. The food is priced similar to many other okazuyas, ranging from a little over US$.50 to US$4.00, but what makes this place worth visiting is the counter help. They are quick, helpful and efficient...and I've never had to wait for more than a couple of minutes for assistance. That really means a lot, especially since parking is so scarce in this mostly residential neighborhood. We all met at a church along the Pali and split into groups of 6 -- one flag person and five trash collectors per team. There was such an overwhelming turnout that some people who wanted to help, just couldn't. They were told to stay back. 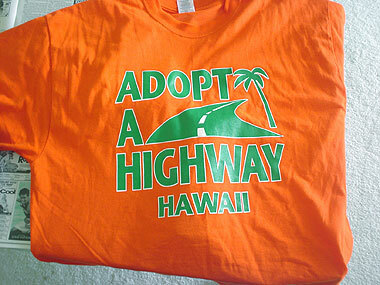 Those of us who were going to be collecting trash, donned our bright orange and green t-shirts and set off to work. After a couple of hours of cleaning the roadway, and gathering 12 bags of trash in the process, our team headed back to the "basecamp". Drinks and a bento were provided by the company as a reward for a hard morning's work (it really wasn't too hard). 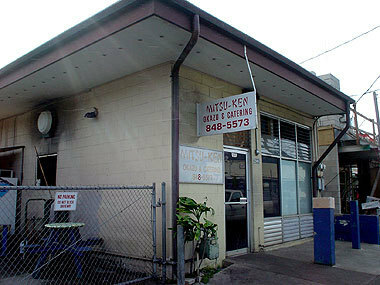 The bento came from Mitsu-Ken in Kalihi. Here's a picture of the shop, I took it a couple days ago. Mitsu-Ken is a typical okazuya-type shop. 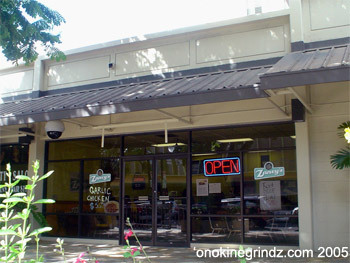 It opens early, and closes early and it offers a wide selection of food items. 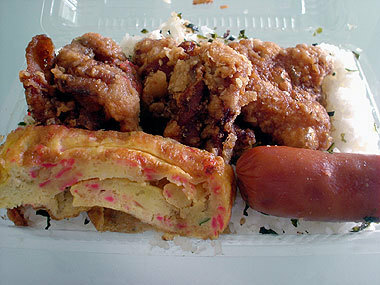 This bento contained three pieces of Mitsu-Ken's famous garlic chicken, one piece of shoyu hot dog and a rolled egg omelette all on some white rice that's been topped with furikake. The chicken is the best part of this bento. It's first deep-fried, then coated with some shoyu-garlic sauce. The sauce is a bit sweet, and a bit salty with just a hint of garlic to it. Unfortunately, the bentos were purchased earlier in the morning, so the chicken wasn't as crunchy as usual, but it was still tasty and surprisingly, not too oily. Guess they drain the chicken well. The rolled egg omelette was filled with chopped kamaboko (fish cake) and a few green onions, and the shoyu hot dog? Well, it tasted like shoyu hot dog! The food here is delicious and is a good value (especially today because it was free). The only reason for my not visiting this place more often is the line that starts to form outside the shop at 5:30 am. Mitsu-Ken, in my opinion, is one of the better okazuyas in the state. 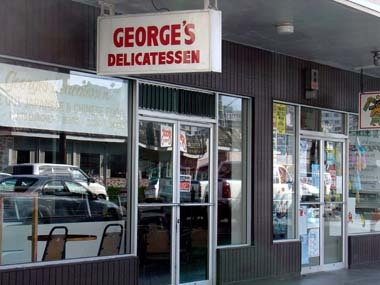 Today, one of my co-workers bought me lunch from George's Delicatessen. It's not a traditional type of delicatessen, with sandwiches and stuff, but more it is an okazu-ya. 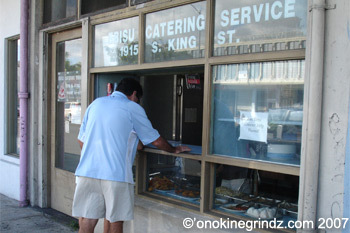 An okazu-ya is loosely translated as: okazu meaning side dish and ya meaning shop. 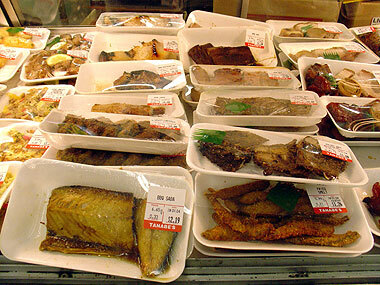 Basically, these types of shops sell side dishes for bento, or boxed lunches. 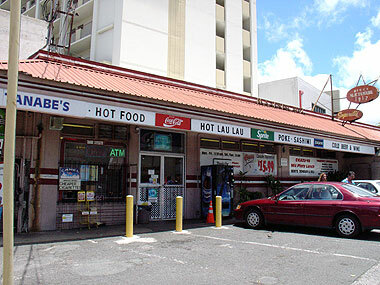 There are many of these little shops in Hawaii, with most opening at the crack of dawn and closing shortly after lunchtime. My co-workers order from George's Delicatessen because they deliver. 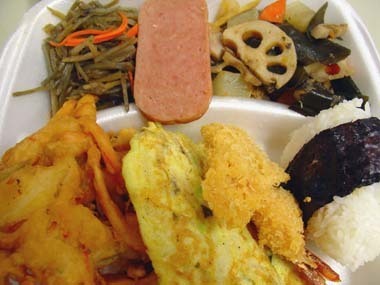 Clockwise from top: kinpira gobo (seasoned burdock root), Spam®, chicken nishime (simmered vegetables), musubi (rice ball) with nori (prepared seaweed) and ume (pickled plum), shrimp tempura, egg omelet and vegetable tempura. 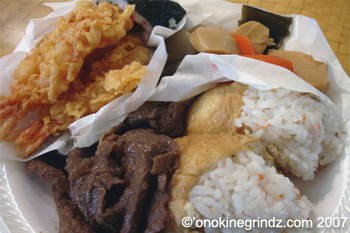 The good thing about an okazu-ya is that you can mix and match food items to satify your taste buds and your budget. 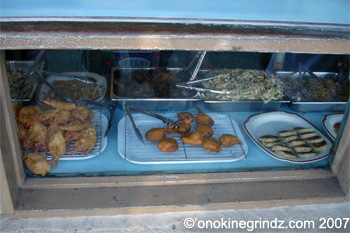 The food items here are priced from US$.50 up to US$4.00. This plate lunch with 7 choices was about US$6.50. Great deal, great variety, and great food!